VigeneTech's image analysis software provides unprecedented accuracy, sensitivity, reliable results, "One-Click" automation and high performances. 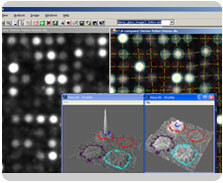 Image analysis software for DNA, RNA, CGH, protein and antibody Microarray, and other array based application images. Automatically grids the array and quantify spot intensities. Sophisticated and robust segmentation algorithm to accurately extract and quantify the signal intensity and area in multiple channel or level, Automatic segmentation of the cells, nuclear, cytoplasm, Histo-Immuno Chemical or antibody straining and other interested signal area. MILLIPLEX™ Analyst v5.1 Flex ..Additional Info..
LEGENDplex™ Data Analysis V8.0 ..Additional Info ..
LuxScanTM hardware scanning control function is embedded in MicroVigene‘s comprehensive Image and data analysis software platform, offering a complete hardware and software integrated system. 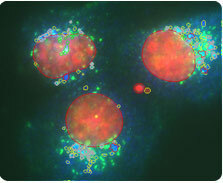 Customized OEM software from VigeneTech provides high quality image quantification and enhances the automation for Whatman FastQuant protein array image and data analysis. Ease of use �C simply follow the wizard to run the app. Direct reads bar code on the image . 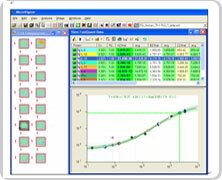 Perform non-linear regression to determine the sample abundant.